Looking for that special high end chaise lounge? The Sposa All Weather Wicker Collection is all of that and much more. The contemporary design and curved lines gives this chaise a look all of it's own, we anticipate this chaise to become our best seller. Comfort and durability is not compromised, just because this chaise looks like artwork. 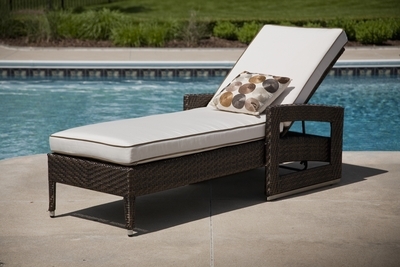 Comes in Viro Prussian Dark Bronze wicker with a full size Sunbrella fabric Canvas Canvas with Sunbrella Canvas Cocoa welt cushion and has a fully adjustable back with stainless steel hardware.